Botanical pumpkins are hands down my favorite craft of the season! When I walked by a class on this craft recently at my local Terrain store, the hip Anthropologie’s gardening sister, it was love at first sight. 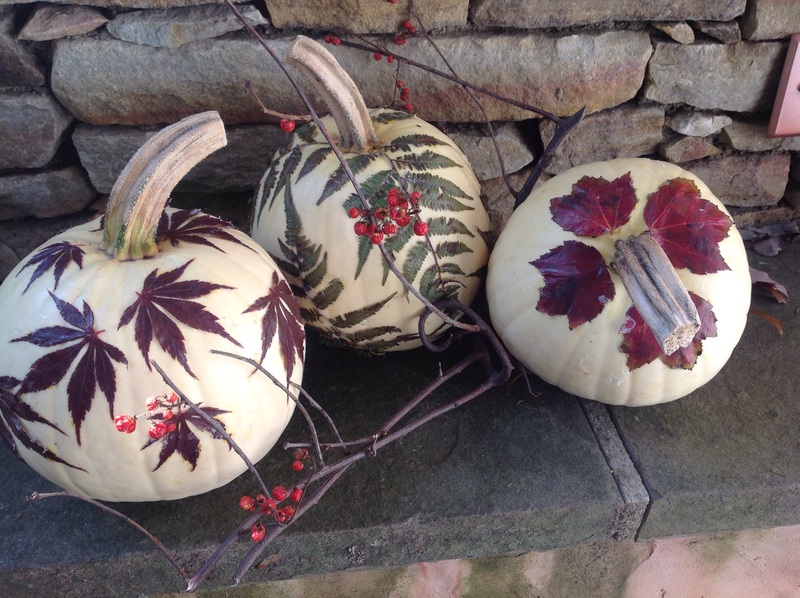 I knew right then I would try my hand at making these botanical pumpkins. They were super easy to create and the hands-on time pretty quick. 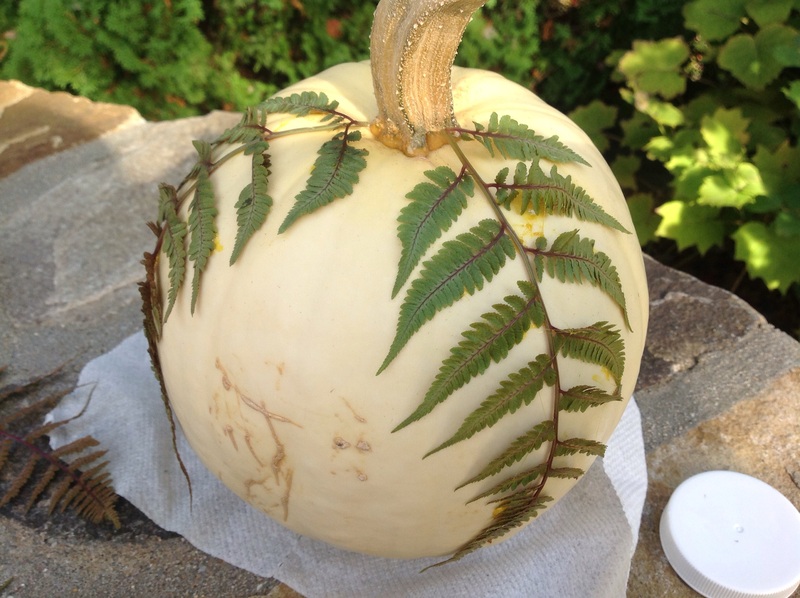 The idea is to adhere natural plant material on a pumpkin. Although the white pumpkins show off the botanicals best, you could use orange ones too. It is best if you select thinner plant materials such as ferns and flat leaves, which will be easier to glue down. 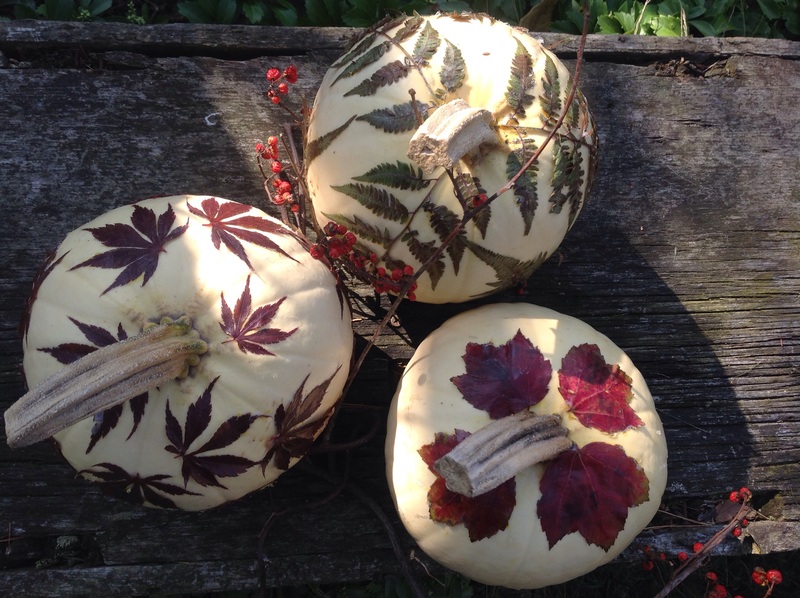 The variations of botanical pumpkins are as endless as your imagination. Have fun! 1- Choose a well ventilated space to work in. Wipe your pumpkins clean and let dry. 2- Cut your plant material and remove stems. Working from the stem center of your pumpkin, lay out the design before beginning to glue it down. 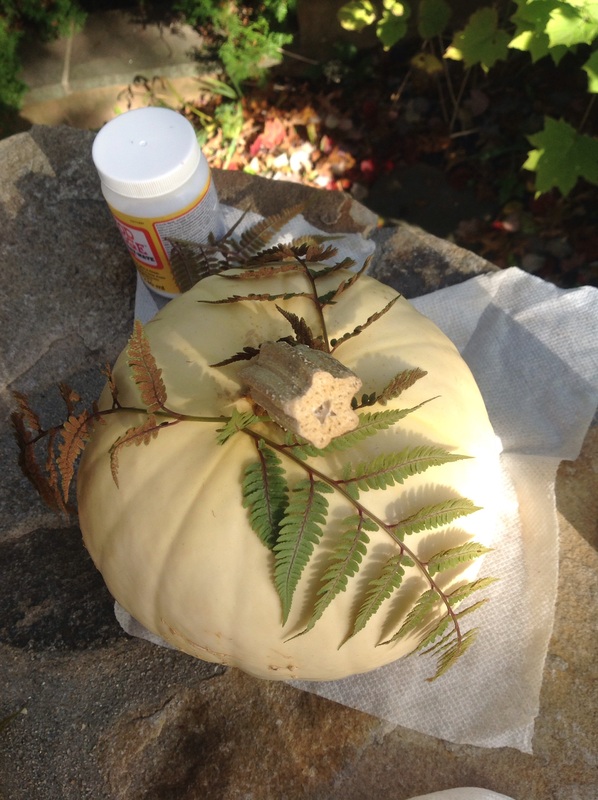 When you are happy with your design, and working quickly, spray a light coating of adhesive on the underside of your plant material and place on your pumpkin. Wet your fingers slightly to rub the plant material to help it lay as flat as possible. This is not perfect science as the plant material is from nature and full of curvature and angles. 3- Once you are satisfied with the design, apply a coat of Mod Podge with a sponge brush. Let dry and recoat. You may need 2-4 coats depending on the thickness of your plant material. I used 2 coats for mine. 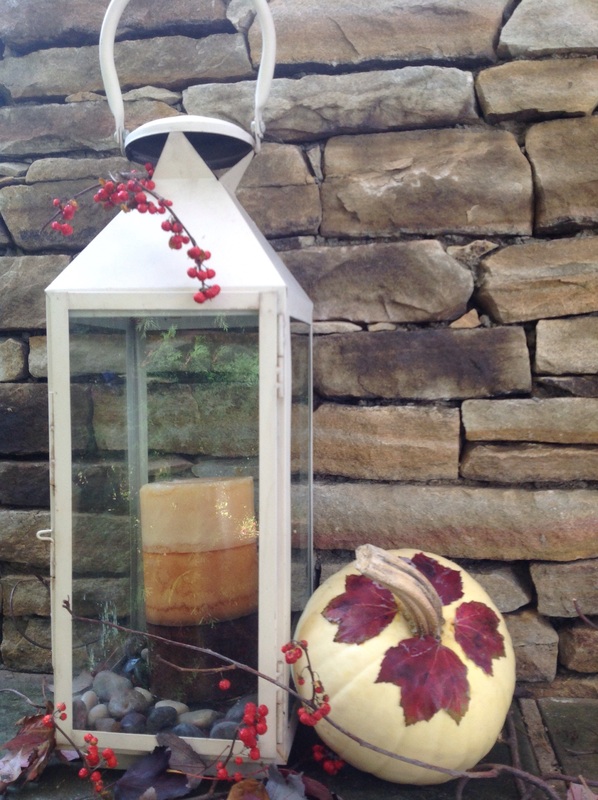 Let dry overnight and enjoy creating fall vignettes with your beautiful botanical pumpkins! Three little pumpkins sitting on a wall…. Oh Canada! The sugar maple leaves, nore minimalist pattern. Variations: you could add glitter to your plant materials before gluing them down. 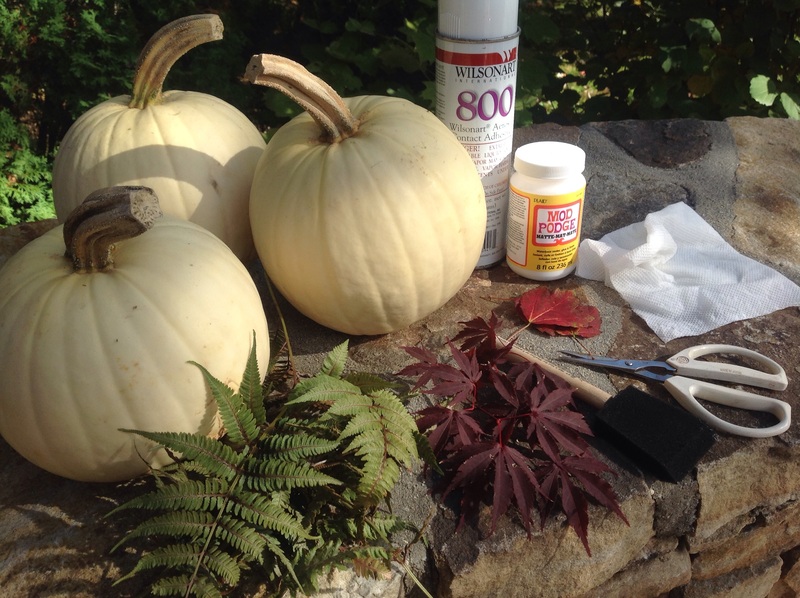 You could also paint part or all of your pumpkin before starting your project. You could gild your plant material in metallics before starting your project. 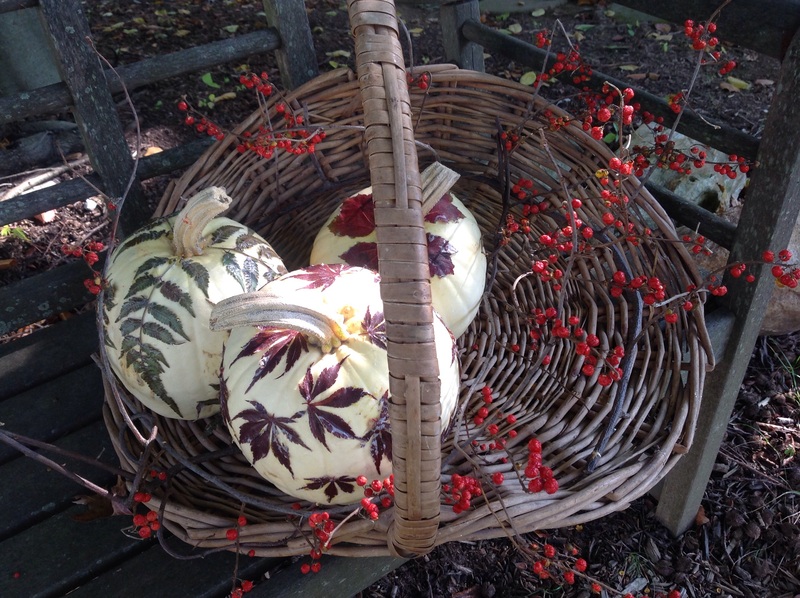 The finished creations will last as long as the pumpkin does..
What botanical pumpkins will you create? 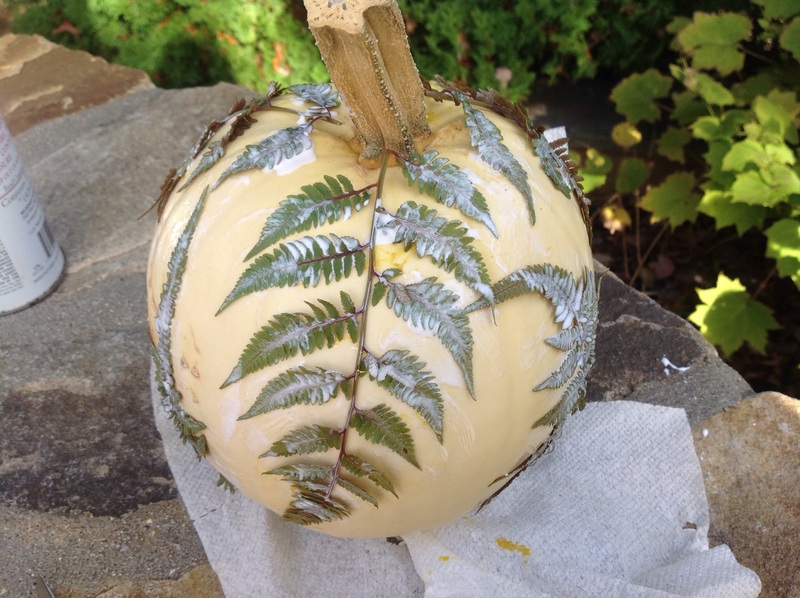 This entry was posted in Crafts, Gardening, Home Décor and tagged Botanical pumpkins, botanical pumpkins craft, botanical pumpkins DIY, botanical pumpkins project, Mod podge pumpkin craft, no carving pumpkin decorating, white pumpkins with fresh ferns glued on them by Johanne Lamarche. Bookmark the permalink. 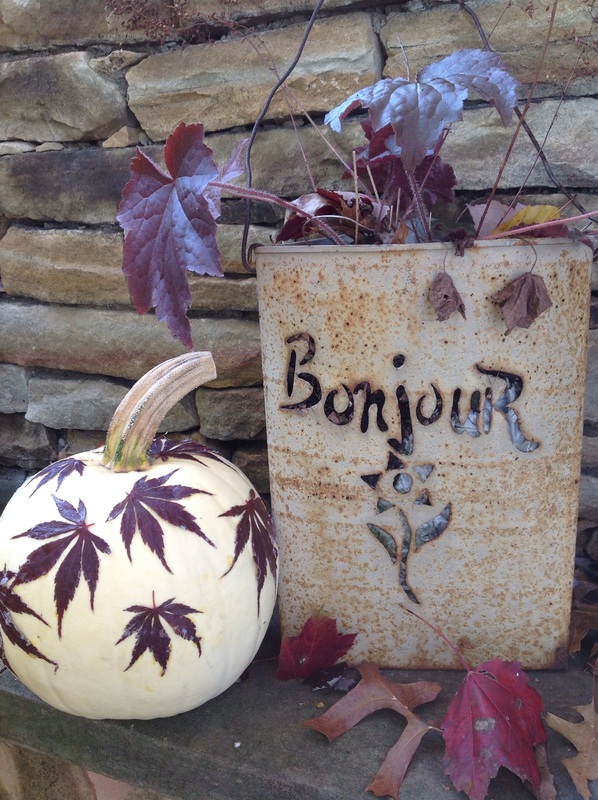 nice ornamental pumpkin art doc…..
can i get one for my clinic waiting room??? Wow – they look amazing!! You are so creative, I can’t believe that you were peridontist – don’t you wish that you could now work with Anthro’s creative team? I could see you blowing them away!! Thank you Selma! That is a huge compliment. Do you have Anthropologie in the UK? I live near the flagship very first one and not too far from their garden prototype. I always get a big dose of inspiration when I visit. Surgery is quite creative as far as the health sciences go and I think I was attracted to it because it was never the same and always required trouble shooting and the manipulation of tissues. Very hands on. I retired prematurely because of a neurological problem but I miss it. Glad you enjoyed the biological pumpkins. They were easy….I know you could create some too! Yes, we have an Anthro on Regent St in the West End – but it’s not the same! Quite sterile in comparison, I think. I used to be really creative but you know, life just gets in the way sometimes!! So sorry that you had to retire like that but at least you are sharing all that wonderful creativity and cooking with us!! Thanks so much! I know you would create a beautiful tablescape with these Alycia! These are darling! I was modge podge crazy when I was a kid! 🙂 I haven’t thought of it for years and years! New fall, you can find your inner ModPodge child and have fun making these!